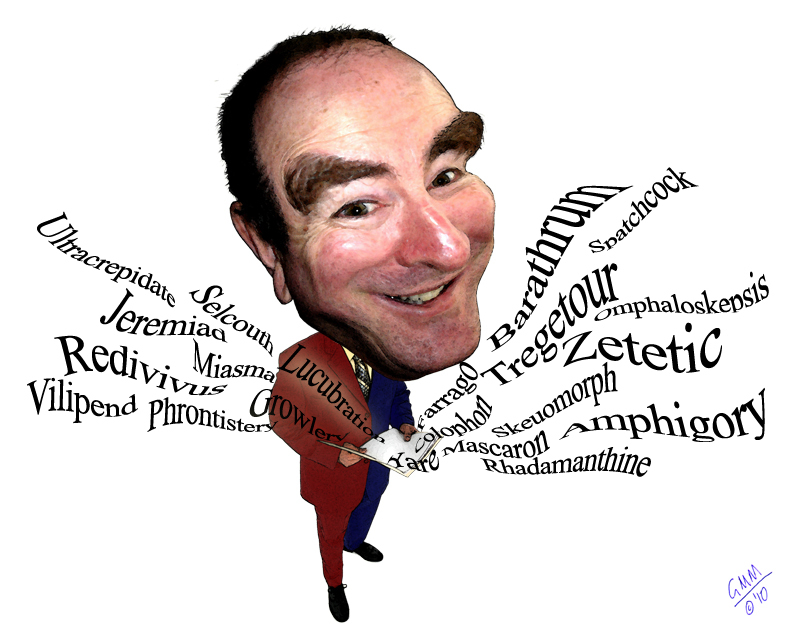 Give the rhymes that relieve rheumatics! Good to see John Key appears to be having a rethink. John says the billboard is inaccurate. Really — which bits? free access to all beaches (including those declared by iwi to be ‘culturally significant’)? Because if he doesn’t, he should apologise to the Coastal Coalition, who are getting mightily sick of being painted as liars. And if he does, then why is he going to the trouble of renouncing Crown ownership? Seems Grant McLachlan thinks I’ve got big eyebrows. Grant sent me this as a parting gift after we collaborated on a couple of projects. I can’t remember meeting anyone with so many talents packed into the one brain. Can you believe that the guy who whipped up this caricature is also a lawyer, an architect, an historian, a screenwriter, a political campaign manager and an inventor? Thanks Grant — fun working with you. Come back Helen Clark, all is forgiven. You may have thought Ethics was a county in England. You may have trampled on our free speech in election year. But at least you locked in our right to a free beach. Just yesterday we learned that John Key can no longer guarantee that right. He can’t be sure a group of part-Maori, part-Pakeha New Zealanders won’t one day tax you for the right to swim, sail or fish in your own bay. By Christmas he may well have traded away tens of thousands of square kilometres of New Zealand coastline for a resource he prizes more highly than all the oil in our territorial sea. There’s a word for that, and it’s not trader. There was a time not so long ago when the National Party could say it was to the right of Helen Clark on matters Maori. It had a leader with principles for whom I was proud to create advertising. As the billboard below made clear (but was cynically misinterpreted by the left), there was never any doubt who Don Brash stood for. As any dictionary will tell you, Kiwi means all New Zealanders, which clearly includes those represented by the last three letters — iwi. But when John Key gives iwi the right to negotiate directly with the Crown — meaning former Ngai Tahu lawyer and strongly pro-Maori minister Chris Finlayson — who will speak for Kiwis? Critics on the left thought it dishonest to characterise Helen Clark as ‘Iwi’. After all, did her Foreshore and Seabed Act not claim the coast for the Crown? But it was not the way the National Party saw things at the time. They viewed Labour’s bill as deliberately embedded with fish-hooks that iwi could use to eventually hook the resources they craved. 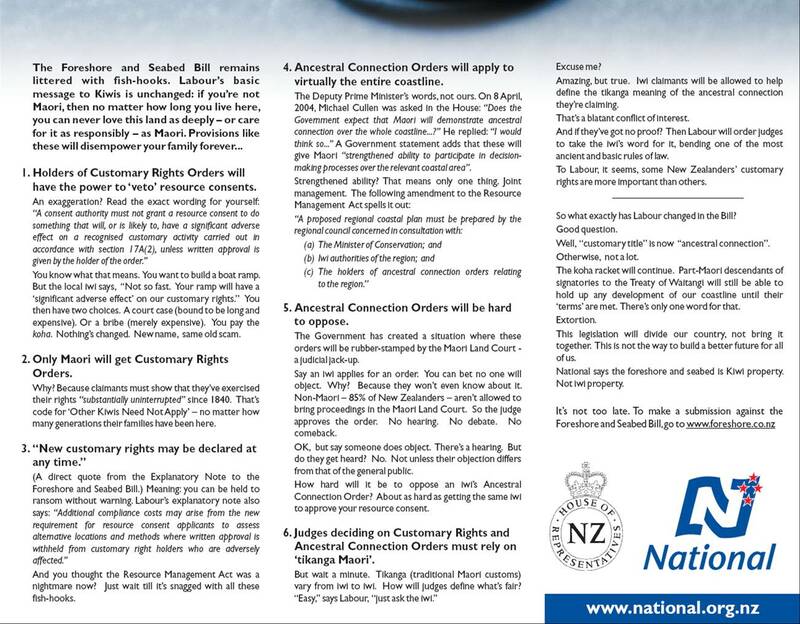 Below is the long copy forerunner of the Iwi/Kiwi billboard, which I wrote a year earlier to spell out National’s concerns. It talks of their fear of vague concepts like tikanga Maori and customary rights. 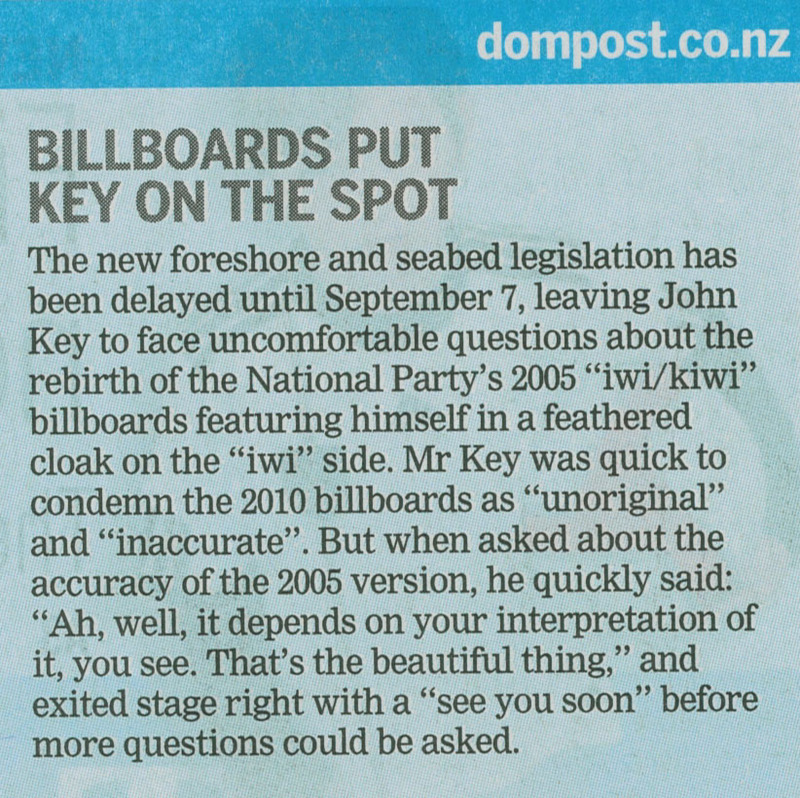 In 2004 the Nats believed those concerns to be real, but it would now appear those fish-hooks were blunt. In the six years since, few if any tribes have succeeded with their coastal claims. So while Clark may have been Iwi next to Brash’s Kiwi, alongside Kaumatua Key she’s ‘Kiwi as’. Key’s foreshore and seabed plans are frightening, as he’s repeatedly shown he’s willing to sacrifice the national interest for the interests of the National Party. For a fascinating insight into principles as a tradable commodity, click on the magnified image at the very bottom and read my 2004 body copy. You may need to pinch yourself as you do. 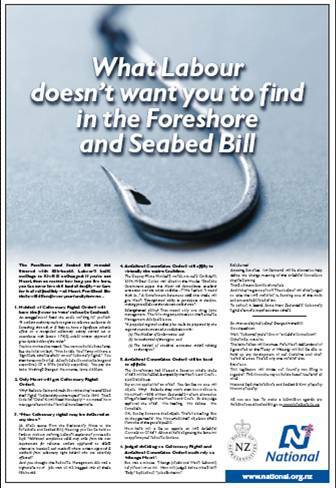 Yes, this is the National Party trying to scare you about Labour’s coastal management — when most of the same fish-hooks are now part of their own policy, but sharper. Click on the below image to magnify the body copy, then again if you need to. This post is also appearing on Muriel Newman’s site www.nzcpr.co.nz. Note: I’ve submitted the billboard at the top to the Coastal Coalition. Hope they decide to run it.